How does a person accept something that is beyond difficult to live with without just giving up all at the same time? 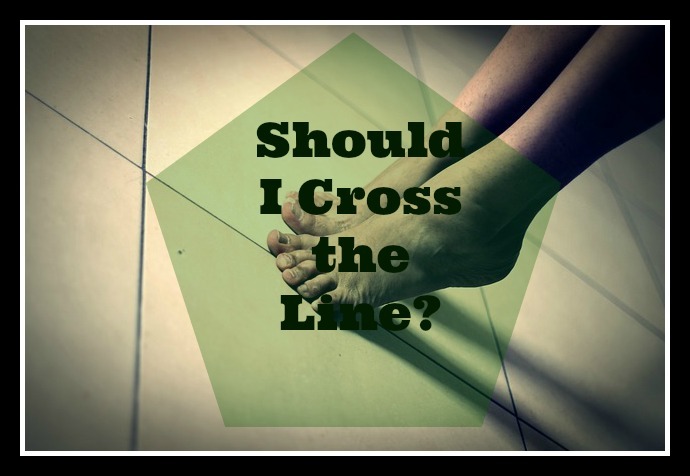 How does one walk right up to the line that spells acceptance, without dipping their toe over or crossing completely to the other side of that line? The other side of that line, to me, is resignation. That spells giving up in my little mind. And quite frankly folks, I’m having trouble wrapping that puny mind of mine around that idea. I’m having trouble with where my toes should be planted – firmly. I don’t yet know how to accept, yet still fight. Will I ever understand this? Maybe that’s part of the whole thing. I’m asking God to show me. He’s revealed many things to me, yet I feel there’s something I am not seeing or hearing yet. I need to be a better listener. For months and months now, I have been pretty certain that what is ravaging my body is Fibromyalgia, but we had to be sure and rule other things out before concluding that (the doctors and me). Now we are quite certain that I do have this F Beast along with Chronic Fatigue Syndrome and, like so many other things in my life over the past several years, I am struggling with the line mentioned above (again). I have a black and white mind when it comes to fight or flight…and that may be yet another reason Fibromyalgia has been able to run a marathon within my body. Make no mistake, there are clear cut physiological reasons why this happens to people, but working on the mind, stress, and a multitude of other things will only serve to help people who suffer from it. Sometimes though, I think I am wrong about that. In fact, I’m sure I am often wrong about it. Sometimes, you gotta just let go. I have always equated that to giving up, but surrender is a form of fighting/battling all its own, it seems. I seem to need a very good lesson in that arena. So….I have come to the conclusion that I need to accept this “diagnosis”, this illness. Let’s just call it what it is: ILLNESS. Ug. Acceptance, acceptance, acceptance of things that my entire being screams against and wants to conquer, crush, obliterate, and fight to the end over! But I know it’s key…this acceptance thing. I just know it. Somehow, fighting (not giving up) is a key player too. But I have to tell you a secret about that: They don’t get along. They don’t like to be on the same team. At least, not in this chick’s head. So back to my question: How does one accept something, yet fight (which you HAVE to do with this illness if you want to have any quality of life at all) at the same time? If you have the answer, oh please, dear one….please share. I know people who had or have cancer or other illnesses- received their diagnoses, course of treatment, and fought the good fight. They had to accept they had cancer, MS, RA, Lupus. They had the choice to fight or not to fight. They had the choice (hard one, as it was or is) to accept or become bitter and stubborn. Some were cured, and some weren’t, but all that I know personally fought. ALL. So why do I feel so badly when there is honestly a part of me that doesn’t want to fight? I know that part of the answer is that somehow, I feel guilty because my illness isn’t “as bad” as some of the other ones out there, yet I want to give up. I think also, that some of my own struggle is that there’s nothing that seems concrete to fight this thing with – one has to approach it holistically and hope for the best. But I guess that’s pretty much how it is with anything of this nature, isn’t it? Fibromyalgia may be more obtuse than other things, but it’s apparently not going to take my life. See, you don’t die from Fibromyalgia. But it does eat away at your body, your mind and your soul. Chronic pain wears you down, yo. It’s literally a full time job to manage it. Just manage it. I already have a full time job, and a family to support. How can I keep this up? It’s wearing me down and I must admit, I just want to go to bed sometimes and not have to get up and keep going. And I find myself still hoping – still hoping I will somehow come out the other side of this thing even though pretty much the one thing that IS conclusive about it, is that there is no cure. God can do anything and I know it. But I’m just not of those kids who tells their Father to give them everything they want. I believe He will heal me fully if it is His will. He knows I believe it. And yes I do pray about it. But mostly, I pray that unless or until he does remove this from me, He show me more of Himself while teaching me how to live in the process and the part of this story I’m in right now. So in a way, that part I have accepted ~ and that’s big. I have accepted that God’s will is going to be done, no matter what I do or don’t do. It’s the physical limitations I am struggling with badly. And the full time job(s). You can walk but not run. You can do situps but not weights. You can eat only veggies or you can be overall healthy with your diet. It’s all just a mushy mixed bag of “try this, try that” and maybe it will or won’t help you. The whole thing is so confusing it can drive you nuts, which then puts the sympathetic nerves into even more overdrive, if that’s possible. And if you have the F Beast, it’s probably possible, believe me. I don’t know the answers, but I do know there are positive things about this too. I have mentioned them in previous blog posts, but I have more empathy for others than I had before. I have a greater understanding of chronic pain now. I just don’t get to do a lot about it, because I don’t have the energy – ha ha. (Is that funny? I don’t know – kinda a half joke, I guess). So is it really just about learning about that stupid line of M Fox’s….the line between acceptance and resignation? The line upon which I stand and accept something crappy, yet decide daily to fight according to what lies right in front of me. Some days it’s about fighting really hard, and other days, the fight shows up in resting, surrender, and doing nothing – just coping. I guess that will have to be “what it is” for now. But I know the answer to that ~ it’s not about just that line, friends. That line does not define me or offer a magic answer that if only I find it, will solve all of my problems. Only God can do that. Lines can be erased. But God is my Rock. There is someone who knows even more about suffering than all of us put together – who knows everything about it, really. Someone who understands, who cares, and who has the answer about that dumb old line and then some! Someone who offers a far greater hope for us than figuring out this riddle and simultaneously being able to do two opposite-type things. Someone who is far greater and far more vast than any disease, limitation, sorrow or syndrome. I am the Bread of Life…. I can accept that fully. Him ~ Jesus ~ The Great I AM. And I can fight for that fully. Him ~ Jesus…. Yah….I’m moving past the line, but not into a place of resignation. The Rock just took its place instead. They may not be pretty, but my feet feel better already. What lies in the Fringes? Is there something bothering you today that you cannot quite put your finger on, but is looming, hovering or threatening to consume you? Or maybe there’s something that you DO know and recognize all too well for exactly what it is and that thing seems to be a shadow you wish to shake off, or maybe even stomp upon until it’s DEAD! Is there a memory there ~ something of a nightmare ~ that evokes fear and sadness and overwhelming desperation in your heart, mind, and soul? Something that makes you thrash and cringe as it encroaches upon your moments throughout your day? Is it creating a battle within your soul? Do you feel like you may be ambushed at any given moment? Is that recollection of the pain, the angst, the possible enemy forces getting ready to pounce upon you, aiming arrows at your spirit? Or do you find yourself in a moment of peace today as you focus more upon the liberating and sweet feeling of having overcome ~ having come out the other side of something that felt so heavy at one time in your life? I must admit, I go back and forth between these two states sometimes. Just call me pendulum Annie. We vacillate, friends. When we recollect those things which are very unpleasant, we can have days in which we feel such freedom now that it is not a part of our day to day anymore and then at other times we find ourselves enveloped in fear that some other form of that kind of pain we experienced will rear its ugly head once again. What if it gets me and eats me up this time? And it’s a part of human nature to do so…especially when it comes to things of the past that we hope to never have to experience again as long as air fills our lungs. But the enemy likes to feed off of human nature, doesn’t he? And he loves fear. When you remember – look back to the hard of that time – how do you see that journey and how it helped your story evolve to where it is today? Was it a trek that you weren’t sure you could endure which resulted in something more beautiful, (maybe more tattered), but in some strange way, made you more whole than you were before? Is it something you hope to never have to repeat again, but that you can still stand in that same moment and realize some part of your character was strengthened from having gone through it? And like me, do you find yourself hoping that it is finished? Once and for all, that the pain might be over? Are you succumbing to the illusion or the false sense of security that the temporal offers to you? I do. I do it all the time. But there’s a kind of beauty in that as well. As long as we are still growing, reaching, stretching and learning ~ there is beauty in having a hope for a bright tomorrow. There is beauty, also, to be found in basking in the goodness of today. So, when we are in a good or better place than we used to be, we can fear returning to a bad place again, can’t we? I fear grief. I fear more death. I fear instability, hardship, more pain, debilitation. I fear paralyzation. I find myself at times entertaining the fear of what lies in the fringes. When I fear, I find that I am judging good and bad based upon what the flesh tells me those things are. But the glorious – oh, the GLORIOUS work that the Lord works within us is not dependent upon our human limitations or notions of what is good or not good. Thanks be to Him. He is the truth, not my own notions. He is the constant, not what may lie ahead for me in this world. But my flesh….oh my stubborn flesh! 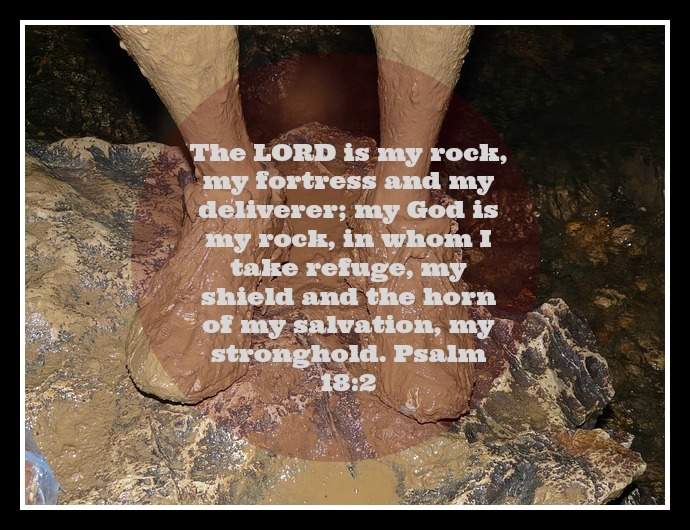 Is He being magnified within me even through the dark and difficult times? Are there things that are residing in the fringes of my life threatening to move front and center and replace Him? It’s easy to have that happen if we aren’t on guard – far too easy. And as I think about all of this, I ask myself: What about in the good times, Annie? The times I label as good (i.e. less hardship) ~ is He still front and center, or am I relegating HIM to the fringes? In the times in which I perceive my need is not as great, do I truly press in to Him and His strength? Do I forget my need for my Savior? Which is more to be feared ~ hardship in which I am beyond vulnerable and rely upon the Lord all the more, or self-sufficiency? I know all too well the answer to that question, and at times I need reminding. It can all be so utterly deceiving. Who do you find yourself relating to better now that you have experienced darker times, friends? Times in which every nook and cranny of your life seemed consumed by something threatening or dark, but in which the Lord filled you with His love, His peace, His light, His comfort and yes, His joy, and lifted you up higher than you had ever been in spite of the sorrow and pain? Do you understand others in a way you may not have been able to before? Are you able to show them the truth and love of Jesus – the truth about our Savior – in a way that seemed impossible before the nooks and crannies of your life were threatened? Is there someone whose kind of suffering you scoffed at before you went through the hard that made you who you are today, magnified Jesus in your life, and moved Him from the fringes to the center? I must admit, I find myself in that place at times, and with each new difficulty, I feel conviction. But then liberation ensues! Because God shows me something new about Himself and gives me an empathy and a drive and a kind of compassion for others I didn’t have before. The Jesus kind! It’s all Him. This is one of the ways that He does his divine and beautiful will within each and every one of us. If we allow Him to work, great things will happen no matter what we go through in this life. Some of them, we will get to see come to fruition. Others? Well, that is for God to know about and we have to trust in Him that He is working. 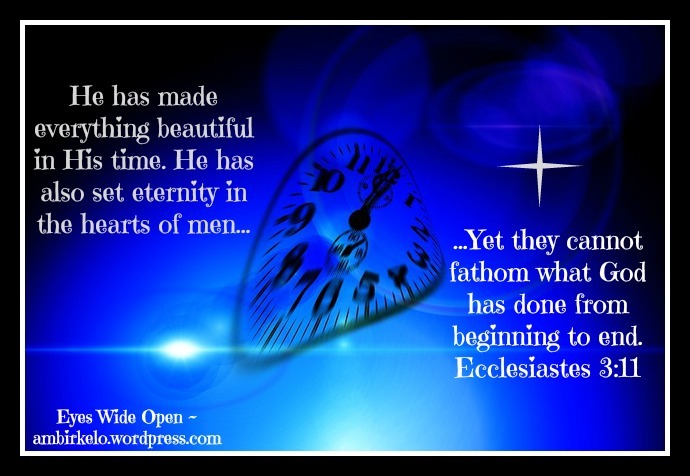 Magnificently and gloriously, He is working! I often find myself uneasy during good times or circumstances. I find now it’s a mixture of fear to go through discomfort or pain again, (when Annie is taking over the wheels of her own mind and heart) and at other times it’s about not wanting to become complacent, desensitized, or over confident and begin living for the things I think that I can control (again). Is it possible for us to enjoy the less challenging times without caving in to living for such things again? Can we truly rely in full upon our Savior without being greatly challenged? Do those two things actually co-exist? Oh, Lord help us not to be sucked in – sucked in to living for anything other than You and what is near and dear to You. Oh, to live to the fullest as You intend, but not be chained to this world, it’s fears, it’s enticements, or it’s dark fringes. Oh, to enjoy life, family, friends and the blessings You bestow upon us without letting anything become more important than You. Oh, to lean into YOU, no matter what the situation or circumstance – because You are here – right in the center of it all. Like babies – moment by moment, yet with eternity in our sights all at the same time. Is it possible? Blur out all but this moment – this moment that is part of the ultimate moment ~ leading us up to that blessed time in which our real lives begin. Blur out all that is anything other than being filled with Him His love for people. Stepping into the fullness of what He has in store for us and starting now. To put asunder notions, judgements, coveting, performance, success, failure, hurts, disappointments, fears. To stand strong and courageous – not our kind of strong -but HIS. Oh how wonderful it is to know that He will never leave us! He rescues us each and every day. From hard and from easy, he rescues us. From pain and challenge or complacency, he rescues us. From the gray – oh the ugly gray! He rescues us!!! Do you hear Him? 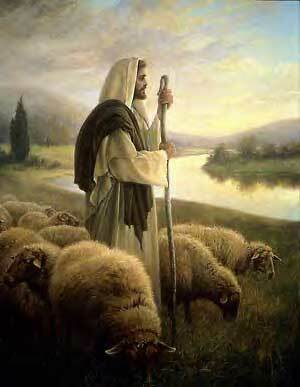 He is calling His sheep. Let us not, oh God relegate You to the fringes. Let us keep You front and center through the good, and through the hard times, through the fear, and through the peace, through the joy and through the sorrow, through the weakness and through the confidence – through it ALL – be the center. And if anything is to be blurred – oh Lord…let it be the enemy and all of his trappings – relegate them to the fringes forever more. Friends, if you feel this way sometimes, just close your eyes for a moment. Just listen. He is calling your name. Do not fear. You are HIS. This song reminds me so much of my need for my Savior and my own need to listen for His voice. I listen to it with my eyes closed frequently. I hope you enjoy it if you have a few moments to listen. May you be blessed as you relegate the ugly to the fringes and let the Spirit of the Lord fill you from the inside out. Whether you have a chronic illness, disease, or a seemingly never-ending trial you face today…this is a beautiful and encouraging post from my dear Heather. Check out her site after reading and let her know you support her as she encourages others through the pain! I thought grief was something I’d have a reprieve from after mama died about four years ago. I knew it would come back in new and even more twisted ways as life went onward, but I thought what I thought anyway. I knew the grief of losing mama was not something to be dealt with and that it would then be over for once and for all. God made me fully aware of this fact when I experienced it with my father’s death decades ago. So WHAT IS IT that I did NOT know that has thrown me for such a loop over the last year or two? A lot, friends. A whole lot. I was mistaken in thinking I had experienced “my share” of grief. Grief shows up in so many ways that we don’t expect – new ways we aren’t familiar with and in times we may not expect it to darken our doorstep at all. When that happens, what we thought we understood or knew about grief goes right out the window and splats into a million pieces down below. But presently – this now that I am in – grief wants to take me,friends. The shards down below the window it splatted and catapulted out of have morphed and grown into something bigger, scarier, and more seemingly powerful than I had thought I’d experience at this time in my life. Grief wants to own me, put its name upon me and seal it that way forever. Grief wants to make grace become second fiddle without question. Grief wants to define me, torment me, smash me and then overtake me. Grief wants to eat me alive. Guess what else I am learning that I hadn’t recognized about this greedy grief before? It’s that it has many friends. It’s many little minion-like friends do a tortuous form of damage all on their own. They serve multiple purposes, not the least of which, is to compound the master that they serve – this is how grief breeds and grows. The list goes on and on, but I can’t write it all out because I’m already crying at this point. (Sorry, but I am). Here’s the thing friends: I know what I know what I know. I just don’t feel it sometimes. That hurts and it hurts a lot (hence, more grief). I know that God’s power is made perfect in our weakness. I know that the present sufferings are not worth comparing with the glory that will be revealed in us. Yes, this list goes on and on too – and it comforts me so greatly that it does. It’s found in His Word – His truth – His promises to us. And for that, I can’t even begin to express how thankful I am. But I don’t always feel good about it. Sad to say, but true. I am a mere little human whose flesh tries to take her eye off of God’s promises. So today my heart grieves, even though my head knows the truth of His grace. Today, I struggle to find how to let the grace that He promises me weigh more than the feelings I am experiencing and meet me in the midst of it. Writing these things down today after a time of prayer is my way of reveling in His grace in the midst of the grief. God put it in my heart that maybe some of you feel this way too today. Yes, until now, I was minimizing grace today and allowing grief to be magnified instead. And I HATE that. How do you allow yourself to embrace the “bad” feelings that you may have and not beat yourself up about it? Did you hear what I said? Not “live by” or “focus solely upon” but acknowledge and embrace and move through them! How do you reach a point where you press into God and His strength and His comfort, (while in the midst of suffering), but not feel badly that you are sad in the first place? Here’s what I do all the time on days like this – this is a snippet of my crappy mind chatter that I have to cry out to God about – ask Him to remove – obliterate – conquer. I know this is negative, friends. But I have something positive to share with you about all of it. You can’t see the positive in full and give it the credit it deserves if you don’t journey through the ugly first. At least, that’s what I’ve found. You can pretend, but it doesn’t really work that way. Did you hear what I just said? THAT is the positive in this. Not just this blog post, but this journey we are on if we are experiencing chronic illness, suffering, sorrow or trial of any kind. It’s part of how the Lord reveals Himself and His power in ways to us we never “knew” before. By allowing the season of sorrow to be magnified – overtaking us almost (seemingly), if we are searching for Him and His grace, we “feel” what we “know” about Him in a way we never could before. This I know. This I cling to. In the midst of my new and unexpected season of grief. What’s His grace about today? In the sorrow and the suffering, a part of “self” is being crucified and WILL be filled with HIM in ways it never could be before! You gotta empty the WHOLE vessel before you can fill it with ALL good stuff. That means…. dump time. All that seems to be “good” has to be dumped out along with the “bad”. We cling, friends. I admit to you today, I am clinging to the parts of Annie I wanted to keep. The beautiful parts I didn’t want dumped out with the ugly. But I know that these are the parts, that if I did keep them, would have been residing in the crevices of the potter’s jar and taking up space that He wants to fill with Himself. But I know something awesome – (because He tells me it’s so). Those good parts of Annie I am clinging to and grieving over today? They are CRUD compared to what He is going to replace them with. So yes, there’s a time to grieve. But there’s a time also to know in the midst of the grief that His grace is already here, and that He is doing something magnificent right now, and that He understands that it hurts a bit. Maybe even more than a bit. 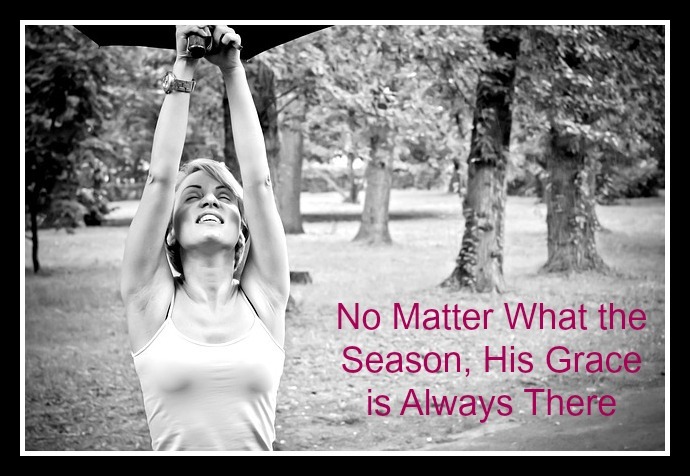 No matter what the season, the one thing that never has to change, is that HE IS ALWAYS HERE. I am being reborn in Him every single day. How about you? Some days it’s harder than others. Do you feel that too in your own life? Do you know that birth is a wonderful event, yet a traumatic one as well? We like to focus upon all the feel-good stuff when it comes to a new birth, but we so often forget about what happened in the journey and the adjustment periods. All you have to do is really think about it for a moment – a newborn baby – the birth process – the sleepless nights – the terrible twos – it’s not something that is always a pretty picture. But one thing’s for sure: No matter how fussy a baby is, or how fitful a toddler might be, it always seems to help when they surrender fully and allow their parent to soothe them. 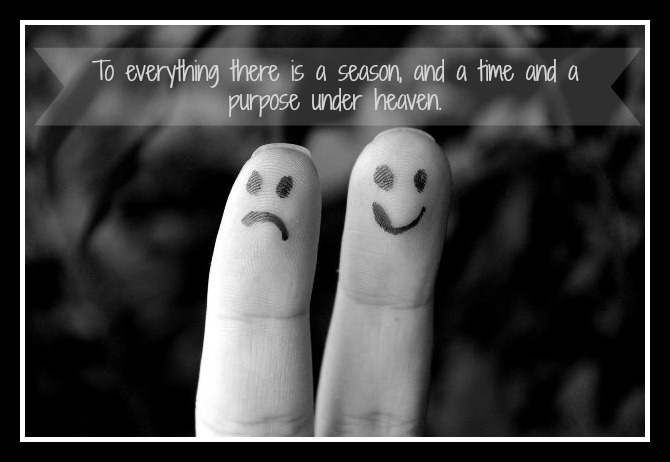 Soothing in every season – surrender in every season – for me, that’s where it has to be. Won’t you join me if you feel the same way today? Join me in the lap of our Almighty Father. The parent of all parents. The One who never changes. The One whose grace WILL conquer our grief. So, God is giving me a nudge….He has His reasons. He will reveal them to me. His timing is always perfect. He’s knocking. He’s telling me to take a break – from a lot of things. He’s telling me to step away with Him for a while….to a different place. Oh, how hard it is to let go. Wisdom given ~ revelations and guidance to be received. 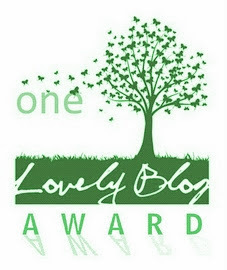 Yes, I will cut the 30 Days of Godly Widsom blog series short…it will be finished, but not until I get God’s green light. This is a new thing for me ` To stop something in the middle. Oh, the disorganization of it all! To leave something unfinished? To stop short? Yes…oh yes, friends. I gotta take a break right in the middle of it all. Because His timing is perfect. He tells me to wait. To listen. To pray in a more focused way. Eleven left. Eleven left to complete the 30 days series. It’s not even an even number, Lord! What will He reveal during this gap? What will He fill the space I make here with? Something of Himself and His wisdom, I am sure. Something of His glory. What shall He reveal to me during this time of healing and listening? I will be praying for you, dear friends. I will be reading what you share as you write and I break for a while. Know that I am praying and this is part of HIS timing. I can’t wait to find out what’s in store.